I made the ladybird square just to try and teach myself to double knit, it took a few rows before I got into the hang of changing colours (as can be seen in the bottom of the ladybird square) but after that it was pretty easy. 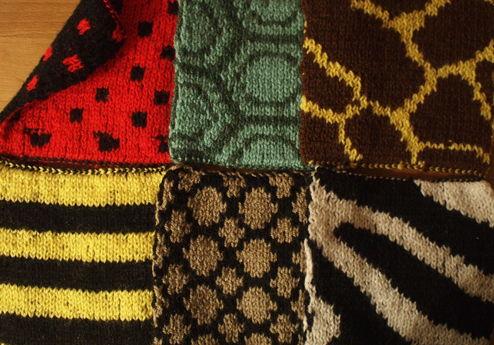 Once I’d done one, a friend gave me the idea of knitting more animal print squares and making a blanket. So far I have made these six and am half way through a tiger. The blanket may be a long way off but the squares could always be used as coasters or trivets. Double knitting is when two yarns are knitted at the same time creating a stocking stitch appearance on both sides of the fabric. If using two different coloured yarns the colours will be reversed on each side. The hardest parts are the cast on and changing colours. How to do a double cast on. Cast 62 stitches onto size 4 needles, alternating yarn A and Yarn B using the long tail method. 1st row *K1 with yarn A (pass both yarns under needle), P1 with Yarn B (pass both yarns under needle)* repeat. 2nd row *K1 with yarn B (pass both yarns under needle), P1 with Yarn A (pass both yarns under needle)* repeat. Repeat rows 1 and 2 until you have 37 rows. 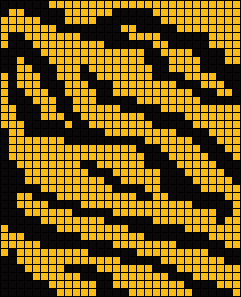 To knit the square with an animal print pattern, choose a chart and cast on in the same way as above. 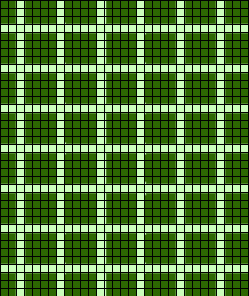 When following the chart each coloured square represents two stitches, the yarn that you knit will be the colour that shows on the front of your work, the colour that you pearl will show on the back. For example if you were following the tiger chart…..
K1 Orange, P1 Black, *K1 black, P1 Orange* Repeat 5 times, *K1 Orange, P1 Black* Repeat 8 times, *K1 Black, P1 orange* Repeat 4 times, *K1 Orange, P1 Black* Repeat 5 times, *K1 Black, P1 Orange* Repeat 7 times. *K1 Orange, P1 Black* Repeat 6 times, *K1 Black, P1 Orange* Repeat 6 times, *K1 Orange, P1 Black* Repeat 2 times, *K1 Black, P1 Orange* Repeat 9 times, *K1 Orange, P1 Black* Repeat 4 times, *K1 Black, P1 Orange* Repeat 3 times. Because you are reversing colours each row, using the chart can become complicated so it’s best to start out with an easy one like the crocodile.